This large Grateful Dead tapestry is approx. 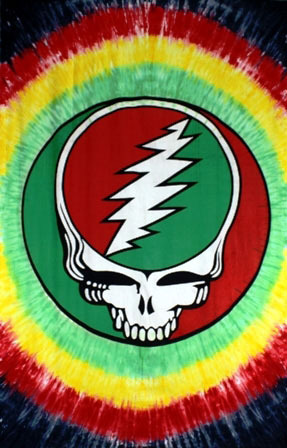 60" x 90" and has the Steal Your Face design in rasta colors. You can use this tapestry as wall hanging in your home or office, throw it over a couch, or as a bedspread on a twin bed. It would look great in a dorm room. Officially licensed Grateful Dead merchandise. Fast shipping, great quality, enjoy seeing it everyday! !